Normal sensors have a well collects a charge as light hits the pixel photodiode, but there has been research lately into a different type of sensor that may offer amazing low light performance never encountered before. This sensor counts the number of photons that hits each photodiode, using a different type of photo diode that triggers a pulse for each photon that hits it. It has virtually no noise as there is no analog to digital conversion, simply a counting of pulses. 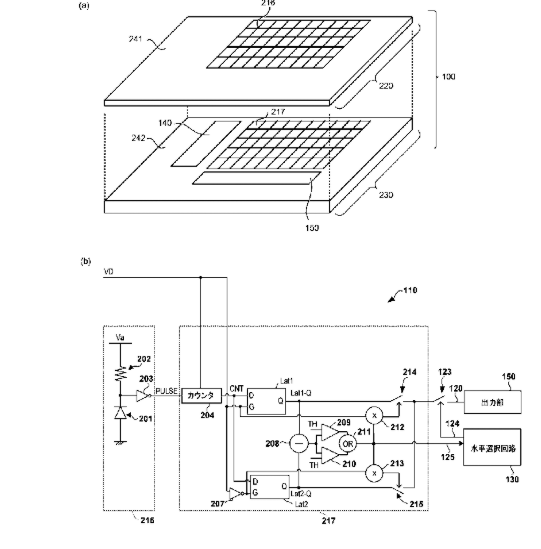 Canon in this patent application shows a stacked sensor with the top portion of the stacked sensor being the individual photo diodes and the underneath layer containing all the electronics.